Quite a bit has happened since I penned my last blog almost two years ago. Without diminishing the importance of those that blog regularly and faithfully, my ministry tends to be a street-level, on-the-ground type of ministry that does not allow a lot of time for writing blogs. Perhaps I should consider changing that. As I’ve embarked on a new season in seeking a doctorate in theology and apologetics, what writing I do engage in has been largely academic and the creation of lessons for my upcoming third edition of Discipleship: Equipping and Apologetics curriculum which expands from the current 32 lessons to 48. I expect it to be published mid-summer. Editing is complete, minus a few minor updates (do they ever stop?) and packaging/publishing has been largely sorted out. 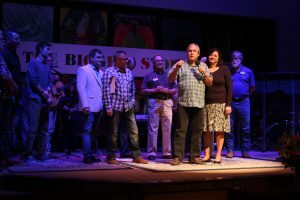 In January, I moved from paid, part-time status as the Pastor of Equipping and Apologetics at my church, Hill Country Fellowship, to full-time. With that, I now teach classes an average of five times per week with some weeks seeing more. So, what has two years since my last blog seen in the area of equipping and apologetics within my ministry? Students: Still the heart of why I do what I do, little has changed in this arena in the way of class offerings. We still study basic apologetics, worldview and Scripture. What has changed significantly is many of my students have been studying with me for two years, some for three. Also, these students are now teaching others. During our VBS last year (“Camp HCF”), I had four students teach a 30-minute lesson to over 70 six graders. Ella taught an introduction to apologetics and the reliability of the Bible, Jorden taught them the difference between Biblical artifacts vs. evidence, Jonathan taught on several archaeological finds that confirmed certain biblical accounts and Kylie taught on how the fine-tuning of the universe points to our Creator. By the way, none of these students were old enough to drive yet. 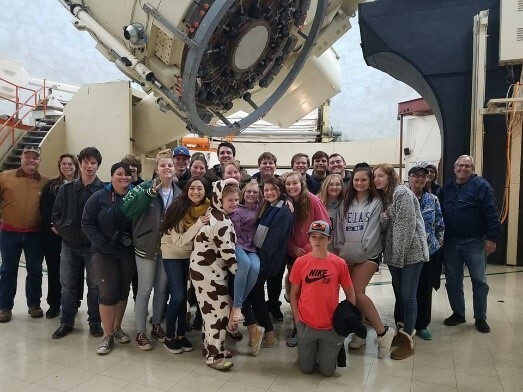 In two years, we’ve taken multiple field trips; Dunham Bible Museum, Probe Ministries, Center for the Study of New Testament Manuscripts, reTHINK Student Apologetics Conference, Reasons to Believe chapter meetings, and more recently, the McDonald Observatory in West Texas this past December. 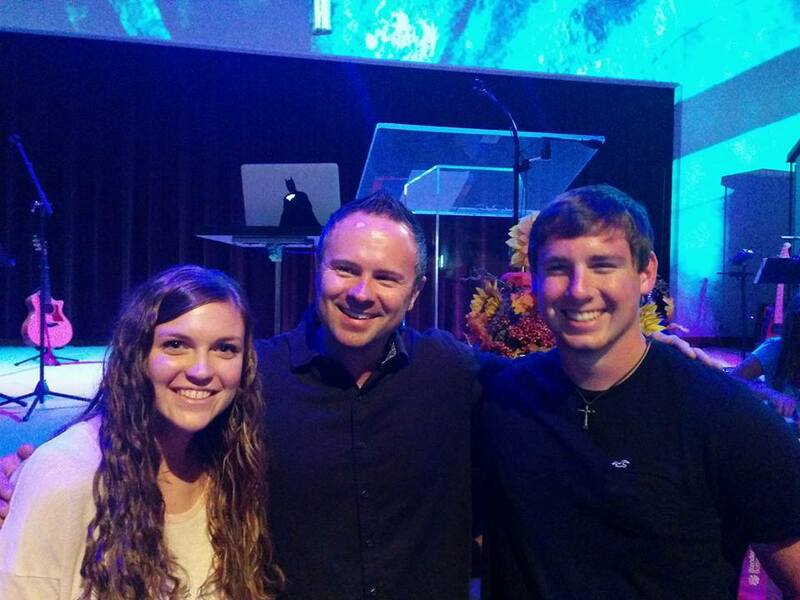 We’ve seen two students attend Summit’s two-week intensive worldview and apologetics conference. 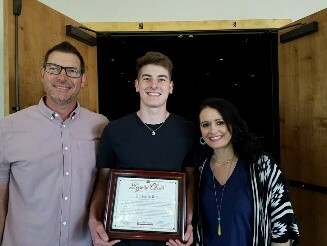 We had one student, Judson, receive the Legatus Christi award from Ratio Christi, their highest award for exceptional students that use their training in apologetics to proclaim and defend the Gospel. 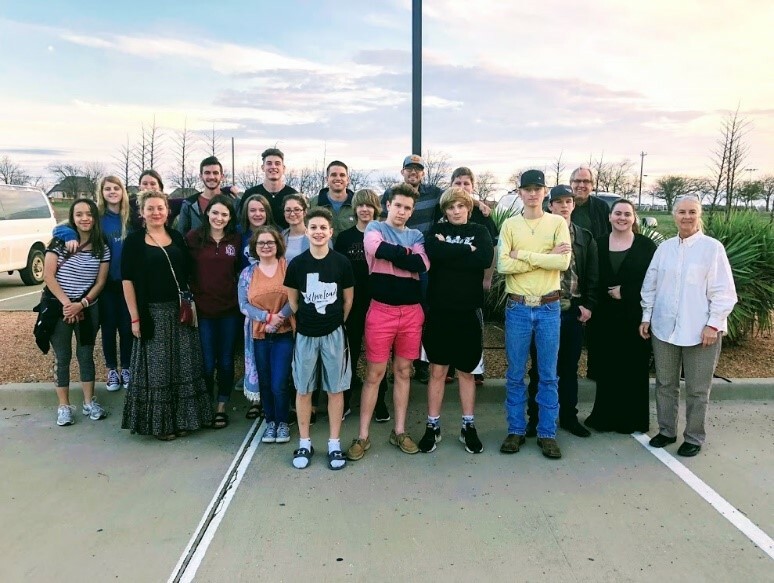 Two other students, Kylie and Jorden, created a one-hour presentation on their McDonald Observatory Field Experience and presented it to the entire youth group on a Wednesday night, as well as multiple small-group meetings and the church’s adult apologetics class. They are also scheduled to present their session to Hugh Ross’s Reasons to Believe Austin chapter in July. We think this will be the first time this scientific apologetics organization will be addressed by high school students. We continue our affiliation with Ratio Christi College Prep, a high school apologetics organization through Ratio Christi (www.ratiochristi.org). Adults: In addition to the basic apologetics sessions offered on Sunday mornings, we have submitted the paperwork to become a Reasonable Faith chapter under William Lane Craig. This group meets on Thursday evenings every week and while at times studies content similar to Sunday morning classes, we often study deeper subjects, driven by events happening in culture. In this regard, these evening sessions are more focused toward worldview issues. 4-1-2 is our church’s primary means of increasing knowledge of core doctrinal beliefs. The name is from Ephesians 4:12 which reads “for the equipping of the saints.” Other pastors and I share during this two-hour session (which includes a 30-minute dinner break). The six sessions are 1.) The Church, 2.) The Word, 3.) The Great Commandments, 4.) The Great Commission, 5.) Culture Shift and 6.) You Lost Me. Each session is intended to help those in attendance grow deeper in their knowledge of their faith and the worldview issues that can either shape them or destroy them. These sessions are offered every two months. Suffice to say, the four “I’s” of my earlier blogs have played out and apologetics is now instilled as part of our church culture. I’m blessed beyond measure that I’m at a church whose leadership understands the importance of the words found in 1 Peter 3:15: “but in your hearts honor Christ the Lord as holy, always being prepared to make a defense to anyone who asks you for a reason for the hope that is in you; yet do it with gentleness and respect,” In today’s culture, we can do no less. In our last blog, part 5 of 6, I posed the question of how to bring apologetics into a church that had no one on staff trained in apologetics and little to no budget. The short answer is to engage a mentoring apologist to help you chart a course. As a mentoring apologist, I have helped several churches begin the process of bringing the discipline of apologetics into their church. So, let me propose several steps to begin the process. If you are reading this, you have found my website. Step one, therefore, is to find someone that can help. In addition to myself, I know almost all my classmates that have or are working on their Master of Arts in Christian Apologetics and most of them would be happy to engage locally. In addition to classmates, I am also affiliated with Ratio Christi, a worldwide apologetic organization that helps facilitate the training of high school and college students. A mentoring apologist or Ratio Christi director/mentor/staffer can be a significant help in starting apologetics in your church or organization. Step two is to start planning. How do you want to introduce apologetics to the congregation? Bring in an A-list apologist? Local apologist? Video? When do you want to start? Anytime? Beginning of a school year? How often do you want to meet? Weekly? Monthly? Who are you going to train? Students? Entire church? What is the budget, if any? Lastly, what curriculum will you use? These are all questions a mentoring apologist can help answer. Before we continue, I’d like to answer the questions above regarding our own church here in Burnet. For our first full school year of apologetics training, we brought in Sean McDowell to help us kickoff the year. The following year we hosted his father, Josh McDowell. We did incur a significant cost for these events (honorariums, travel expenses, advertising, etc. ), but we opened both events to the entire community, so the benefit extended well beyond the needs of our own church. We had determined that our training would meet weekly on a Monday night for students and later, Thursday night for the entire church. This coming year will see, for the first time, synchronized schedules where both adults and students will get the same lesson within a few days of each other. The intent is to enable parents and students to talk about what they’ve learned outside of the class. Aside from the cost of bringing in Sean and Josh, we have a modest budget to allow for a few special events during the year. We have had several guest speakers come and talk with our two groups. Dr. Sarah Salviander, a University of Texas research astrophysicist has lectured on the cosmology behind the Genesis creation account and the Christian influence on modern science. Christian filmmaker Brandon McGuire also visited us to share his film, Mining for God. The previous year, we showed his film to students and invited Brandon to Skype with us, which he did. Cost? Zero. We do give honorariums to our guest speakers to help them continue in their ministries. We’ve also taken a field trip to the Dunham Bible Museum in Houston, about a three-hour drive for us. Cost? Zero. Do you need a lesson on Islam? $7.95 from the Summit Ministries website. A one-hour DVD lecture by noted apologist Nabeel Qureshi. William Lane Craig has an excellent series called On Guard, which is a complete curriculum. No budget to buy? Dr. Craig live-streams his Defender classes every Sunday for free. The options are abundant for low to no cost curriculum. <Insert shameless plug> I’ve developed a full year curriculum (Discipleship: Equipping and Apologetics Second Edition) that I offer for a suggested donation of $25. It includes 32 lessons and breakout sessions, teaching notes and student study guides and artwork for a three-ring binder. You can contact me through the contact page if you’d like a copy to review. I also offer many other lessons not packaged with the above edition, a list that can also be found on this website. 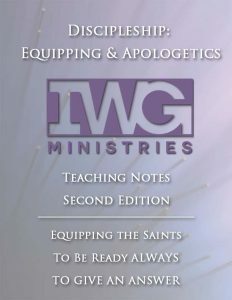 We’ve now completed our walk through The Critical Need for Integrating Apologetics into Youth Ministry. I pray that you’ve found this helpful and that you’ll help turn the tide of the youth exodus from the Christian faith. My delay in writing this article was to allow a certain event to unfold so the “Instill” step could be better illustrated. More about that toward the end of the article. The fourth and last step in the process of bringing apologetics into the church is to “Instill Apologetics” as part of the culture. 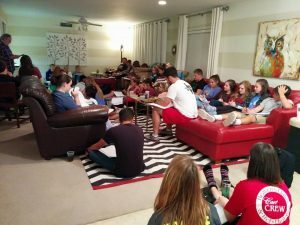 From our pilot year with high school seniors, to the high school students (not just seniors) the following year and now this year, apologetics is becoming part of our culture. In our first full year of teaching high school students, we had research astrophysicist Dr. Sarah Salviander from the University of Texas visit our students. Sarah was a former atheist; she came to share not only her testimony but how the account of Genesis accurately represented the order of creation events in Genesis. This wasn’t only our regular 30 to 40 students. About 100 people from our church showed up. The moms and the dads and the grandparents. So, you can see what’s happening now. Apologetics has become part of our church culture. Both the students and adults are now interested. The event I mentioned at the beginning of this article happened on Sunday, the 26th. On that day, I was ordained and commissioned as Hill Country Fellowship’s Pastor of Equipping and Apologetics. Apologetics has now been completely instilled as part of our church culture. In three years, our church has gone from knowing very little about apologetics, to it now becoming an important part of our culture. Last night was the first church-wide apologetics training kick-off. We’ll continue through the remainder of the year, but next year, both the students and adults will be taught the same lesson each week to allow families to have conversations about their faith. Equipping and apologetics will be part of continual education for our church and anyone in the surrounding community. This concludes the steps on the four “I’s” of apologetic training for your church. Well, that’s a good roadmap you might say, but we’re a small church with no one that knows apologetics and little to no budget to support this type of training. Good news! How to do it under those conditions will be the subject of the last article in this series. The third step in this process is to “Include Apologetics”: You don’t do one shot by bringing in the guest speaker and say “okay, we’re done.” We had the chaplain for the San Antonio Spurs come up to talk to us one Sunday. He was an outstanding speaker and had a great message for us, but that was it. You can’t do that with apologetics. This is a discipline that needs to be fostered and promoted. So you include it as part of a curriculum. 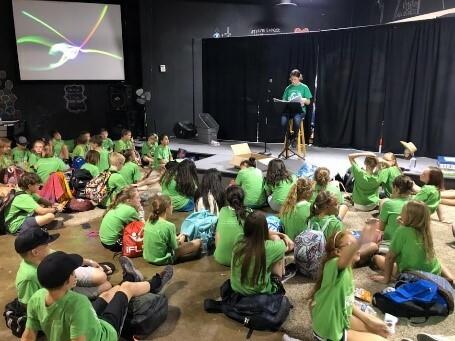 In our first full year with high school students, Sean McDowell helped us kick-off apologetics training on Sunday, with a special service for the students on Sunday afternoon. He challenged the students with his “atheist encounter” role play and we had one specific student, a senior that was one of our pilot students the year before, challenge him on the accuracy of the Bible. He didn’t let her win the argument, but later he confided he recognized that she must have been one of the students trained in apol ogetics because she spoke in a way that only a student familiar with apologetics would do. Here’s Sean with Danielle and Jarrett, two prior high school seniors that came back from college for the weekend to help us kick-off our first event. The day after our kick-off event, Monday evening, we had about 20 students. Three nights later it was aroun d 40 students. Keep in mind, this was in addition to their regular Wednesday night youth group. These students were making an additional commitment to come and learn. Why? It was something that they had never been taught before. The solution is easier than you might think. There are abundant resources available that can be used to teach apologetics. Most only require that someone facilitate the training. I’ll address resources in more depth in Part 6 of this series. A good curriculum would include, besides lessons, other activities to reinforce the training. On this site under the “Resources” tab, you will find our complete listing for our first full year of apologetics training for our students. Figure if you follow a school year, you will have about 16 nights of training per semester. The curriculum I’ve created includes 8 lessons and 4 suggested breakout sessions per semester. These can be supplemented with optional activities. Mix it up. Teach, train, engage others to help. Lectures/lessons, field trips, guest speakers and special events can encourage students to engage and learn much more about their faith and how to defend it. If you live in a large metropolitan area, see if there are museums that have content that support the study of biblical time or lands. Here in Texas, in Fort Worth, the Tandy Archaeological Museum contains artifacts from various locations as well as the Baxley Archaeological Park which features a scale model of Qumran, home of the Dead Sea Scrolls. In Houston, the Dunham Bible Museum contains a rich collection of bibles throughout the centuries and an operational, replica Gutenberg printing press. Our guest speakers (not our kick-off speakers) are local. We’ve had our pastor share with students about leading someone to salvation in a winsome manner. We’ve had a former atheist and research astrophysicist visit and share how modern cosmology supports the creation account in Genesis. This was open to the entire church and in addition to our students, about 100 members from the church and surrounding community came to hear her speak. Inviting others to your student apologetics training is how you can instill apologetics into your church. That will be our topic next week. Now that we’ve established the reality that the data is accurate and young people are leaving their faith, if there any data that suggests we can reverse the trend or at least have an impact on it? I’ve been involved with Summit Ministries as a volunteer and go-to apologist for both staff and students. Summit does a deep 2-week conference each summer in three locations. Last year they averaged about 2,500 students. Let’s look at their data in a report called Turning the Tide, available from their website. By examining 50 years of their student graduates, they compiled the following chart, taken from their report mentioned above. This first chart reflects the changes in the student’s faith before and after they attended Summit. Before they atten ded Summit, 15% understood world views, after Summit 85%. The ability to defend their faith went from about 20% to 80%! But here’s one that’s in support of all the data I’m sharing. Church attendance. It’s identical. The before-and-after is no different. There’s a lot of students that go to church that can’t defend their faith. They don’t understand world views. They don’t know how to share their faith. Their devotional and prayer life are lacking and only 1/3 of them have no confidence in the truth of the Christian worldview. Perhaps they are the ones that see no issue in co-habitation prior to marriage. If it even leads to marriage. So let me ask a poignant question. In which column do your students fit? This next chart is the core Christian values, the six values, as defined by Barna Research. This chart compares the results of the average American, the average born-again Christian and Summit graduates. Summit grads fare significantly better than the other two groups. 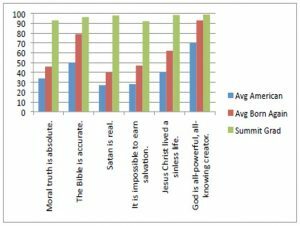 Summit grads are above the 90 percentile range in their beliefs regarding core Christian values. Regarding the six core values, Summit grads hold firm to an absolute moral truth, in contrast to the rampant moral relativism of society today. They believe the Bible is accurate and that both God and Jesus as presented in the Bible are real. 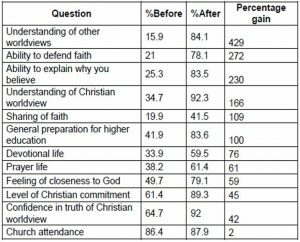 This data supports the idea that the trend identified in Part 2 of this series can be reversed by implementing a worldview and apologetics-based curriculum for your students. So the next question is, how do you start? The first step is to get buy-in from your church leadership, usually the senior pastor. You will usually encounter three types of pastors. The first type is the pastor that is already there. He recognizes the problem and is ready to address it. I was especially blessed as this was my pastor. The second type is the pastor that may be somewhat unaware or unsure, but is at least interested in getting more information. The next step is to share the preceding data. I like to summarize the data on one page, highlighting the most relevant points (see the resource page of my website for an example). Once you have the buy-in to proceed, it’s time to introduce apologetics to your church if it hasn’t been done before. The easiest and best way to introduce apologetics is from the Sunday morning pulpit. The more support from the church, the better. There are any number of well-known apologists that can be booked for a Sunday morning or better yet, a Sunday morning and a Sunday afternoon event geared especially to the students. That’s what we did at Hill Country Fellowship. We brought in Sean McDowell and he helped us kick off our first full year of student apologetics. His father, Josh, did it for us our second year. If your church is smaller and budget is an issue, there are any number of reasonable alternatives that will be discussed in Part 6 of this series. The important point to remember is that introducing apologetics to your entire church will be helpful as you rollout the “Include” part of these four processes to have a lifelong effect on your students. That will be our topic next week. I’ve been involved with student ministry in varying capacities since accepting Jesus Christ as my Lord and Savior in 1998. In those almost 20 years, I’ve seen many students walk away from their faith. It always bothered me. Why did they leave? Were our games boring? Pizza cold? Oh, and what about the messages? Truth is, the competition for our student’s attention has become more intense with the 30-second sound bites, instant access to data via the internet and later, smartphones and a world that has become increasingly secular and hostile toward Christianity. Don’t believe me? Most of my career was spent dealing with data. I was a IBM DB2 specialist for most of my career. I started working in the DB2 software development organization, and eventually ended up selling it. Well data has an interesting characteristic. Data in and of itself is neither true nor false. It is just a fact. Now one could argue that data can be false and you’d be correct. But if you sold 5 widgets and said you sold 10, then the data would be falsely mispresented. Five sold widgets are just a fact, in this example. So data is important. In the part 2 of “Why student apologetics?” we’ll be digging into some data that shows a youth exodus from the church that some pastors and youth leaders still deny. I will be presenting four key processes on how to address this youth exodus. And yes, apologetics plays a critical role in equipping students to better grow in their faith, remain strong in their faith and learn how to share and defend what they believe. In summary, those four key processes are 1.) Identify the need for apologetics in student ministry, 2.) Introduce apologetics to the church at large, 3.) Include apologetics as part of a regular student curriculum and 4.) Instill apologetics as part of the church culture. In our next installment we’ll look at the data regarding the youth exodus and identify the need for apologetics as a means to counter the exodus. A good friend, Mike, recently asked about my thoughts on these verses. Here is my response. Matthew 7:21 – “Not everyone who calls out to me, ‘Lord! Lord!’ will enter the Kingdom of Heaven. Only those who actually do the will of my Father in heaven will enter. The key to this verse is “those who actually do the will.” We must be doers, and not just proclaimers, of faith (“Faith without works is dead.” – see my commentary of the two uses of “works.” One is born of duty and one is born of love for Jesus and what he has done for us). We see this same principle elsewhere in Scripture, particularly James 2, which is a warning against prejudice (James 2:1 – …how can you claim to have faith in our glorious Lord Jesus Christ if you favor some people over others? and also James 2:17 – So you see, faith by itself isn’t enough. Unless it produces good deeds, it is dead and useless). This appears contradictory to other teachings where we are justified by faith and not according to what we have done. This is where we really need two definitions to convey the idea of “works.” These verses in apparent contraction can be found in Genesis 15:6; Deuteronomy 9:4-6; Matthew 9:11-13; John 8:4-11; Romans 3:22-24, 4:4-5, 16, 5:2, 8, 17, 9:10-12, 10:3-13, 11:6; 1 Corinthians 15:10; Galatians 3:1-3, 7, 9-12, 21-26; Ephesians 1:5-12, 2:8-9; and Titus 3:4-7. The Bible tells us clearly that we are not good enough to provide for our own salvation (Romans 3:23). Our Holy God cannot abide in our sinful presence or lawlessness (James 2:10) and we then require a Savior (Romans 8:3-4 and Titus 3:4-7). While these two doctrines may appear contradictory, they are in fact complimentary. First, we are saved by grace alone (we don’t deserve it) (Ephesians 2:8-9 and Titus 3:4-7), but saving faith alone is never enough if you believe James 2:26 – Just as the body is dead without breath, (other manuscripts use the term “without spirit”) so also faith is dead without good works. Note here I am intending this definition of works to be works born out of our agape love for God, not obligation. I’ve heard a good analogy that while many counterfeiters may make exceptionally good counterfeit currency, closer examination will reveal they are not true currency. Similarly, true faith can be discerned by examining fruit (Matthew 7:16-20). We may not be able to determine if one’s fruit is born out of a desire to serve a Holy God out of love or merely as a means to gain the favor or acceptance of others. The question here is this; did the people actually do the things they were speaking of? We have a clue in Luke 6:46-47 – “So why do you keep calling me ‘Lord, Lord!’ when you don’t do what I say? I will show you what it’s like when someone comes to me, listens to my teaching, and then follows it (emphasis mine). I would argue that they never did prophesy or cast out demons, etc. Their intent was to deceive by claiming to have done these things. Even if they did successfully prophesize about a person or event, it was probably only a lucky guess that they had done it correctly. Sadly, many people who claim to be a Christian can tell you they attended membership classes at church, got baptized, tithe to the church and helped out at the ministry fair for the community. This is the type of works-based mentality that some will engage in to merely impress others with their “Christianityism”. Titus 1:16 – They profess to know God, but deny him by their works. They are detestable, disobedient, unfit for any good work. Note here the adjective qualifying the second occurrence of “work” in this passage; “good.” This is evidence of the two types of works that can be found in scripture. Unlike the first occurrence of “works” in this verse, “good works” are the works born out of a love for God and it is through these “good works” that our treasure is stored in heaven (Matthew 6:20 – Store your treasures in heaven, where moths and rust cannot destroy, and thieves do not break in and steal.). So were these people ever “born-again” believers? According to verse 23, the answer is an emphatic “NO!” Jesus told us He never knew them. This is evidence that while they may have claimed to done things in Jesus’ name, it was in name only; there was no repentant heart or surrender to Jesus as their Lord and Savior. Answer the Christian: Why do people suffer for a sin Adam committed long ago? God chose Adam (and Eve) as His “spiritual representative,” and we now have Adam’s sin imputed to us through his sinful act of disobedience to God in the Garden of Eden. In this view, known as federal headship, it should be noted that this does not mean actual sin has passed to us by way of Adam, but only through his actions is God holding us accountable. In much the same way, Christ’s subsequent righteousness can be seen as imputed to us. An example of this would be a wealthy industrial leader that had many productive factories, and through his financial missteps and bad decisions, was now bankrupt and forced to close the factories. The workers were not responsible for his bad decisions that produced this result, but they bore the consequences and lost their jobs. The Bible also gives us reasonable proof of this claim of inheritance, found in Hebrews 7:9–10: “Even Levi, who receives tithes, paid tithes through Abraham, so to speak, for he was still in the loins of his father when Melchizedek met him.” In this verse, Levi is the son of Jacob, who is the son of Isaac, who is the son of Abraham. It established in this account; Levi was “still in the loins of his father” although his father was not yet born. Not only are we descendants of Adam and Eve in a physical sense, but a claim can be made that we have also inherited their soul and by default, their sin nature. In defining traducianism, Millard Erickson writes, “We receive our souls by transmission from our parents, just as we do our physical natures.” The sin nature of Adam and Eve has been passed on to us through our soul. People no longer have to suffer for a sin committed by Adam and Eve long ago. In an analogy, consider a couple that generations ago inherited the family fortune and proceeded to squander it away. While the current family may be living in poverty because of the actions of a great-great-grandparent, they are not directly responsible for what happened decades earlier. They are, however, still paying the price, living in poverty. But suppose a benevolent person comes along and tells them, “I will restore all you lost. All you have to do is receive the gift I am giving you.” In much the same way, that is what Jesus Christ has done for us. We can break the chain of the sin of Adam and Eve by accepting the free gift of the Last Adam, who was without sin. While at Summit Colorado this summer, I engaged in a discussion with a bright young student on the issue of baptism. The discussion centered around two question, the first of which had to do with the definition of baptism and whether it always implied a water baptism by full immersion. The second question was regarding baptism as a requirement for salvation. While not exhaustive, this should help clarify those questions. The root of baptism in Greek is “bapt” and there are many cognates of the word found in Scripture. In brief, it can mean immersion, washing or sprinkling, trouble (Jesus referring to a “baptism” he must undergo in Luke 12:50, suggesting a difficulty or trouble), a pouring out, this one often associated with the baptism of the Holy Spirit. Strong’s Greek 908 – baptisma, baptism (Matt. 3:7, Mark 1:4, Luke 12:50, Acts 1:22, Eph. 4:5, Col. 2:12) means the rite or ceremony of baptism. Strong’s Greek 909 – baptismois, washings (Heb. 9:10) means dipping or ceremonial washing. Strong’s Greek 910 – baptistas, baptist (Matt. 3:1, 14:2, Luke 7:20, 9:19) is a noun indicating a formal title. Used in scripture only with John the Baptizer. The water of the amniotic sack surrounding a baby in the womb. The ritual baptism of repentance practiced by Jews as part of their faith. The immersion of a new believer in Christ (our traditional view of baptism). A spiritual washing of the soul (cf. Deut. 30:6, Jer 31:31-34, Ezek. 11:18-20), signifying a new birth that cleanses and renews. The first meaning is clearly not intended because it is physically impossible for a grown person to re-enter the womb, miracles notwithstanding. While the second may be possible, it is unlikely that Jesus intended this as He came to proclaim a New Kingdom, not the one the Jews were in at the time. Also important to note that even if Jesus intended this definition, He followed the “born of water” with a requirement to also be “born of the Spirit.” The third is also not likely as this form of baptism did not yet exist and it was only after Jesus’ death that this became a common practice. That leaves us with the last option, of which Nicodemus would have been familiar. This option was the option Jesus was advocating. Further, in looking at the Greek, the word “and” is the Greek word kai, and can be translated either “and” or “even.” If it’s translated “even,” it casts a whole different light on the issue and supports the idea that “born of water even the Spirit” means the spiritual regeneration that comes from repentance. “Water” and “Spirit” are often synonymous in the Old Testament. Acts 2:38 is also used by those that claim baptism is a requirement for salvation. This also fails the context test when studying the Greek. Here the word “for” is examined and found to have several possible definitions including “in order to be,” “because of, as the result of,” or “with regard to.” Most scholars agree the proper interpretation of this passage should read “because of” or “Repent, and let each of you be baptized in the name of Jesus Christ because of the forgiveness of your sins; and you shall receive the gift of the Holy Spirit.” Also, both John 3:5 and Acts 2:38 must align with other scriptures that clearly fail to demonstrate water baptism as a requirement for salvation. The Bible tells us that salvation is by faith alone (see John 3:16, Ephesians 2:8-9, Titus 3:5 to name a few verses in support of this). If baptism is a requirement for salvation, Paul is remiss in his failure to insist on it in multiple verses throughout his writings. Lastly, baptism as a requirement for salvation is contrary to the nature of God. Consider two examples. The first is the thief on the cross we read about in Luke 23:32-43 with Jesus saying to him “Truly I say to you, today you shall be with Me in Paradise.” Clearly the thief was not baptized, yet he would enter the Kingdom with Jesus. Some would argue the thief died under the OT law (before the NT) but this logic fails when we consider the salvation of the apostle Paul on the road to Damascus. Second is an objection that contradicts the idea that God is love. Consider a scenario whereby a person truly receives Christ as their Lord and Savior, say perhaps on a Saturday night service and has plans to be baptized the next day in church. They are killed in a car accident on the way home that evening, never making it to church the next day. Would a loving God consign that person to hell for failure to complete the act of receiving Jesus? This is completely contrary to His nature. For a further discussion of this issue, I recommend D. A. Carson’s commentary, The Gospel According to John.